Hand stripping that is! But before we tackle wire coated breeds, start out by revisiting episode 73, back to basics grooming. This will give you a good foundation to move forward with working on your wire coated breed. All coat types need specific grooming in order to keep the dog in top condition. Show dog or couch dog, they all need to be clean, brushed and maintained so they stay happy and healthy. Show dogs with wire coats are hand stripped (either with bare fingers or using a stripping knife) in order to remove dead coat, create a shape and tidiness to the dog’s outline and maintain the proper coat texture for each breed. With few exceptions, the terrier breeds and their owners and handlers are the stars of the strippers. Each breed has a very specific pattern to be applied to the dog and within each breed there are *superstars* who have elevated the trim to a work of art. Names like Gabriel Rangel, Maripi Wooldridge, Bill McFadden, Tracey Szaras, Leonardo Garcini and more in terms of the current handlers, in addition to legends like George Ward, Ric Chashoudian, Clay Coady, Birgette Coady and so many more first rate dog people spring to mind when we think of the great terrier people and their stunning charges. Toy dogs including the Brussels Griffon and Affenpinscher, as well as standard and giant schnauzers in the working group, are also very specifically patterned and detailed. In the Sporting group wire coated breeds including GWP, WPG, Spinone and WireVizsla require maintenance with a more natural finished look than is required for the terrier breeds. Irish Wolfhounds, Scottish Deerhounds, PBGV, and Wire coated Ibizan hounds call for minimal grooming, while Wire Dachshunds are a bit more stylized. The new Herding breed, the Berger Picard is also a very low maintenance wire coat, but does need hand stripping of ear fringe and raking of the body coat. Pulling a dog’s hair, always in the direction it grows. Wire coated dogs have what’s called a “releasing hair follicle.” In nature, the dog’s work would cause it to catch the coat in weeds and sticks, and the hair would simply pull out relatively painlessly rather than get tangled as a longer, silkier hair type would. Proper technique for hand stripping is to be sure each hair is firmly grasped either between thumb and the side of the forefinger or thumb and blade and pulled *straight* back in the direction of the growth. This can get tricky around the bum and at the sides of the neck where the hair grows in different directions. Do NOT pull *up,* away from the dog or against the grain of the hair. Your hand should follow the line of the dog’s body, with your wrist kept straight in order to avoid breaking the coat. If using a stripping knife, be sure the blade is used only for a better grip. If you cut or break the coat, you’ve accomplished the same thing as shaving the dog. Be sure, as you are pulling coat, to hold the skin in front of where you are pulling to keep it taut and minimize any discomfort for the dog. Well, then what is Raking? In certain instances, you may want to rake out undercoat to help create the desired shape (remove bulk at the shoulders, over the loin or the base of the tail for example). In this instance, you can use a *dull* stripping knife laid essentially flat against the dog and simply “rake” or comb along the coat in the direction the hair grows. Done properly you will see only the soft, fluffy undercoat show up in the “teeth” of the knife. If you see hard coat in the knife or if no under coat is removed, your technique needs some work. You can also use the Mars Coat King in various tooth widths for this task, although the caveat of keeping your wrist absolutely still so as to not break coat is even more imperative. The coat king is an amazing tool for breezing through a dog with heavy undercoat, but beware of damaging the top coat. Most professionals won’t use a new stripping knife and trust only tools they’ve had for years. Stripping blades, when first acquired, can be dulled by rubbing on a hard surface. A good tip for newer groomers is to use a Dr. Scholls (or similar) callous remover (kind of like a smooth pumice stone) to learn how to pull hair without bending your wrist or breaking coat. The stripping stones made by Chris Christensen and others offer the same advantage. Another trick is to use the rubber “finger tips” sometimes used in offices for flipping through paper and/or harsh coat grooming chalk which gives a better grip to the hair. If a dog has particularly sensitive skin I’ve used the R7 ear powder which contains a bit of a numbing agent. Finding the perfect stripping knife for your own hand, type of work and consistency of use is very personal. I use a 20 year old Pearson fine for flatwork and a standard run of the mill cheapo coarse blade for work on body coats. If I’m working on a dog with softer coat that I’m worried about breaking, I’ll even turn the knife over and use the flat edge. Some folks I know wrap the teeth in athletic tape. I only use my fingers when working on furnishings as the hair is so easy to break. After pulling coat on a dog, remember those hair follicles are open and susceptible to infection if not properly maintained. I dampen the dog all over with a lightly diluted (10:1) mixture of Listerine and water. This serves as a disinfectant without softening the coat. Then rub the coat firmly, in the direction it lies, with a rolled towel. Blot or squeeze dry the furnishings, don’t scrub. The frequency with which you need to work a dog’s coat depends on that original assessment you made of the dog’s coat and what you see as the dog grows coat between grooming sessions. A rule of thumb is a jacket needs to be “topped,” in other words the long hairs pulled to maintain shape, weekly. Flatwork, depending on the breed and how precise the work needs to be, might need to be touched up every couple days. Generally furnishings are pulled every couple weeks. Keep in mind that even individuals within a breed will differ. One German Wirehaired Pointer pulled down tight to start new coat growth might look good in a couple weeks. Another it might be a couple months. Learn your individual dog before you “pull it to the skin” a couple weeks before the show! This is common practice with terriers and any other of the more stylized breeds. This means that on a regular basis, generally once a week, you comb up the coat on the jacket and pull just the longest hairs. This will keep the coat in good bloom — in other words looking shiny and healthy — as well as maintaining the proper shape for the show ring. This is the terrier terminology for all of the coat on the head, ears and throat. Breed specific diagrams and instruction will tell you how “tight” the flatwork should be. Again, what is required for an Airedale would be a disaster on a Wirehaired Pointing Griffon. 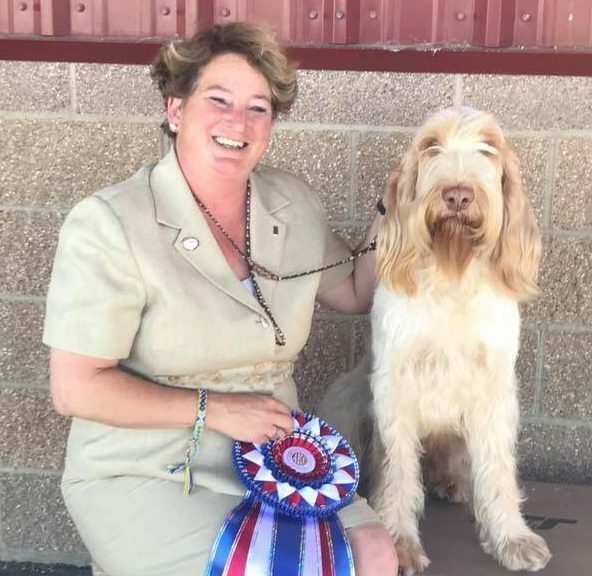 Know what your breed standard says about grooming and talk to the master breeders and handlers to gain an understanding of the final picture you want to create and how to do it. This includes legs, beard and underline. To keep the coat in top condition, this hair needs to be pulled regularly also. Remember, the more you pull, the more and better coat will grow back. In many cases, the furnishings on many breeds are softer coat and require special care not to break the hair. Generally furnishings are pulled or “topped” at a less frequent interval than is needed for flat work and jackets, but that is a rule of thumb, not written in stone. Again, seek the advice of a talented mentor in your chosen breed. A special note on beards. All bearded dogs have hair that grows along the lower jaw in the fold of the lip. This is like a drainage area for saliva. It is often stained and can encourage yeast and or bacteria growth. This hair should be pulled (beware, this is one area that is not at all comfortable for the dog) or thinning sheared away, depending on the requirements of your breed. Keeping this cleaned up will make for a much better looking — and smelling! — beard. The jacket or body coat of wire coated breeds is bathed rarely. In many cases only once or twice a month. The furnishings are bathed and conditioned routinely in order to promote growth and minimize breakage. For full baths, everyone has a favorite product, mine is #1 all systems crisp coat shampoo. Check with your breeder or mentor about theirs. Learning to handstrip a coat well and properly takes lots of practice and years to refine skills. My best recommendation for success is to find a GWP breeder or handler of wire coated dogs who is willing to give you hands on supervision and direction. Good luck and good wins!